Nothing pleases me more than the sight of a Champagne flute being set within my grasp. But after visiting Ambonnay Champagne Bar in Portland, Oregon, I might be changing my tune. Not about Champagne, but rather the flute. Owner David Speer was kind enough to answer my questions about his decision to eschew the Champagne flute. I also couldn't resist coaxing a few Champagne (and sparkling wine) recommendations from him, as well as getting David to reveal some thoughts on pairing this iconic wine with some surprising dishes. I was surprised that you serve Champagne not out of the customary flute, but out of glasses meant for Pinot Noir (Red Burgundy, specifically). What led you to decide that? The idea came initially from a seminar I attended with Georg Riedel, who came with his various Pinot Noir glasses. He mentioned that he likes vintage Champagne in the Oregon Pinot glass, so I gave it a try. It was great to drink Champagne in a larger glass because I could appreciate so much of the nuance of the wine. After more experiments and tasting I settled on the Burgundy stem as my preferred choice. What advantages does drinking Champagne out of a Pinot Noir glass have as far as enjoying the aromas and flavors of the wine? Most Champagne is made with Pinot Noir and/or Pinot Meunier; both of these grapes do very well in the Pinot glass, and it's not bad for Chardonnay either. Ultimately what I find with the Pinot glass is that I have ample room to swirl the wine, get my nose in the glass and really get to smell the wine. 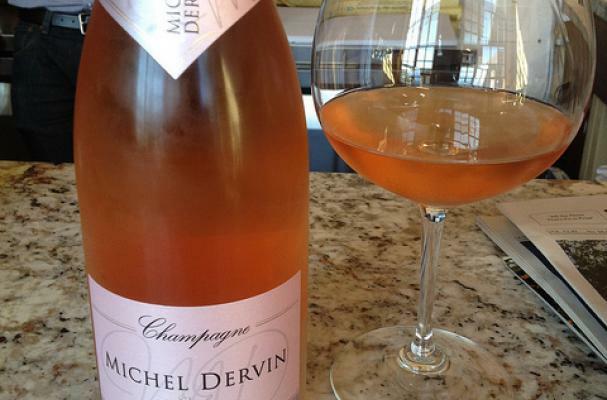 I find the larger glass helps bring the bass tones out in Champagne – blueberries, earth, game, mushrooms. It adds another layer of complexity to the apples, pears, minerality, and citrus tones often associated with Champagne. Should I feel bad for enjoying Champagne out of a flute? For me, a lot of the pleasure of Champagne is the cascading bubbles that you get in a flute. Don’t feel bad, I love the elegance of drinking of a flute, there’s nothing quite like it. That being said I save my flutes for less complex wines. If I’m going to enjoy an amazing bottle of Champagne I do want a larger glass. I’ve also seen fellow wine pros drink Champagne out of a white wine glass. It seems that many of my colleagues are moving on from the flute. What reaction do you get from customers who have only enjoyed Champagne in a flute? How do you go about suggesting they give a Pinot Noir glass a try? When Pinot glasses aren’t available, I’ll use a white wine glass as well. I almost decided on this for Ambonnay, but the Pinot glass ultimately won out because some wines became noticeably better in the Pinot glass over the white wine glass. Anyway, I don’t give my guests a choice, I just pour the wine in to a pinot glass. If they put up a fuss, I have flutes on hand. I’ve found that in addition to enhancing the wine, serving Champagne in the Pinot glass also starts a conversation with my guests about Champagne and helps remove it from the realms of something that you only enjoy during celebrations. I’ve found the large majority of my customers appreciate the larger glass after the initial shock of not being served a flute. Do you think in ten years or more we’ll be seeing Champagne increasingly served in a glass besides a flute? I think at places that are excited about wine and Champagne you’ll see a move away from flutes, probably sooner than 10 years. It's also more economical for the restaurants and bars to use a white wine glass because they don’t have to buy another glass that has limited use in their establishment. Ok, enough glass talk. Let’s talk about what you’re pouring into the glass. Can you give me two Champagnes to seek out that are unique and exciting? Also, is there a style of Champagne that you think deserves more attention? 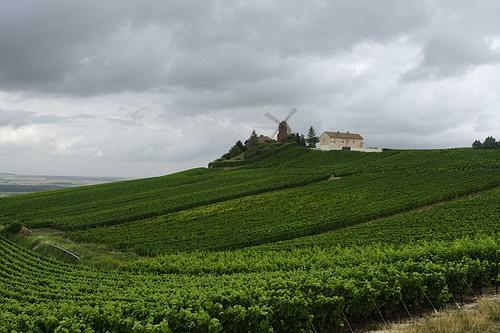 Jacques Lassaigne Vignes de Montgueux Blanc de Blancs Brut NV – This wine comes from the Aube in the southern end of Champagne, which is pinot country except this one hill in Montgueux where they produce fantastic Chardonnay that has a definite tropical note. Lassaigne is the benchmark producer here, and his wines are always delightful. The Vignes de Montgueux is his entry level wine, but is profound and delicious. The rest of his line is equally impressive. Bereche & Fils Reflet d’Antan Brut (2007) – Raphael Bereche is one of the exciting next generation winemakers shaking things up at the family estate. This wine is a roughly equal blend of all three grapes made in a perpetual blend (like sherry but without the flor and criaderas) that was started in 1986. The wine is a blend of 2/3 of the perpetual blend and 1/3 of the new vintage. It's an absolutely fascinating wine, achieving the rare combination of intellect and hedonism. What if I don’t have a Champagne budget? How about a couple sparkling wine recommendations? If you don’t have a Champagne budget figure out a way to cut your expenses. Champagne is way better than cable. Anyway, assuming you’ve made all the cuts you can and are working hard, here are 2 of my favorites on a budget. Chateau des Vaults/Domaine du Closel Brut Sauvage NV – Closel is one of my favorite producers in the Loire valley, Savennieres specifically. She makes this sparkling under the original name of the estate. It's 75% Chenin Blanc from Savennieres and 25% Cab Franc from Anjou. It's compelling and fascinating and you can absolutely taste the terrior of Savennieres. Scarpetta “Timido” Brut Rosé NV – This comes from the Master Sommelier/Chef duo of Frasca in Boulder, CO. This wine is from the Veneto in Italy and is a blend of 60% old vine Franconia (Blaufrankish for you Austrian fans) and 40% Pinot Nero. I love this wine because it's super easy to drink, yet if you care to think about it, the wine reveals unexpected layers of complexity. What are your favorite food pairings with Champagne? 1.Extra Brut Blanc des Noirs with dry aged steak – this is hands down one of the best pairings out there and will make you question why you have always had big reds with your steak. Examples – Andre Clouet Silver Label, Marie Courtin Resonance, Vouette Sorbee Fidele. 2. A richer style from a larger house, think Bollinger, Roederer, or Pol Roger with lobster mushroom risotto. I love this pairing because all of the richness of the wine and the dish play while being lifted with the acid in the wine. Gorgeous. 3. Grilled vegetables with a blanc de blancs from Oger. Oger is a Grand Cru village that is in a valley, so the wines tend to be richer and spicier than its more austere neighbors. It's awesome with veggies from the grill – cauliflower, romanesco, green onions, romaine lettuce, etc. Examples – Jose Dhondt, Jean Milan. I could go on and on, but always remember Champagne works with just about everything. Thirsty for more? Check out my wine blog at jamesonfink.com. Great post! I've had bubbly from wine glasses rather than flutes on many occasions (including once in a restaurant-I was told I would get more that way) for the reason you note, it's easier to pick up the aromas from a wine glass than a flute. In my experience though, there is a trade-off. The flute enable you to assess the bead better because it's narrower. I drink bubbly at least once a week, and for me the nose is more important than the perlage, but sometimes I drink out of both! Thank you for the kudos. As I learned from David, there is definitely a time and a place for both glass and flute. Cheers! I love this post, keep up the great work, Jameson!! Thank you. If you haven't been, put it on your list of places to go in Portland. About three years ago, I switched to serving nearly all sparkling wines in Riedel Vinum series Burgundy glasses, for the reasons cited. Some slightly delicate wines still require a flute to focus the aromas and target the nose, but I like the bigger bowl—and yes, I swirl it, too—for all BdB and BdN wines. Thanks for your comment and your swirling candor. Cheers!